It's very rare that I write fashion posts, but I felt that this particular item was worth the blog. Just before the New Year I spent my Christmas present Topshop Vouchers on this amazing cape. 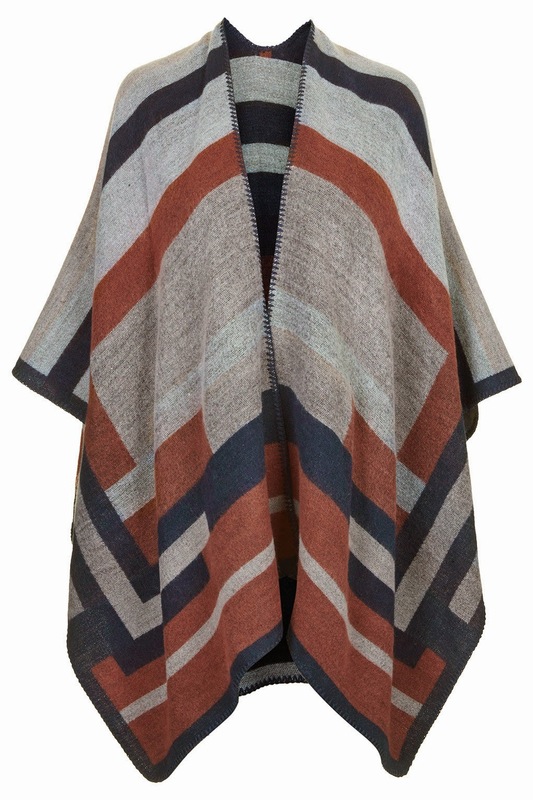 Better known in Topshop as the 'Topshop Colour - Block Geometric Patterned Cape'. It's beautiful, the reason I bought it was for work, being winter the office is freezing and I hate the early morning drive when I have to scrape the ice off my windscreen and hit the road. Capes are so handy to keep you warm and provide comfort when it's cold outside. It's like being wrapped up in a blanket! There were so many options to choose from, but I love the colours within this particular cape. The navy blue and burnt orange really are great winter colours and are better than my usual black, grey and cream winter selections. I thought it would be great to share this winter buy with you! I wore it for the first time today and received nothing but compliments from colleagues so it's definitely a fashion item I would recommend! And for £32 you can't go wrong! !